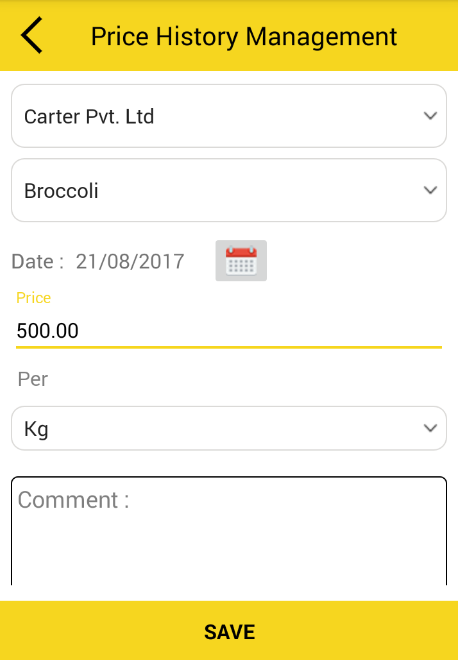 It allows the salesmen to download and upload product through CSV sheets, take orders, message order in the field and export order. Its a very simple but a very useful application. Using this order booking software, person can view address details of customer, make call and share message. 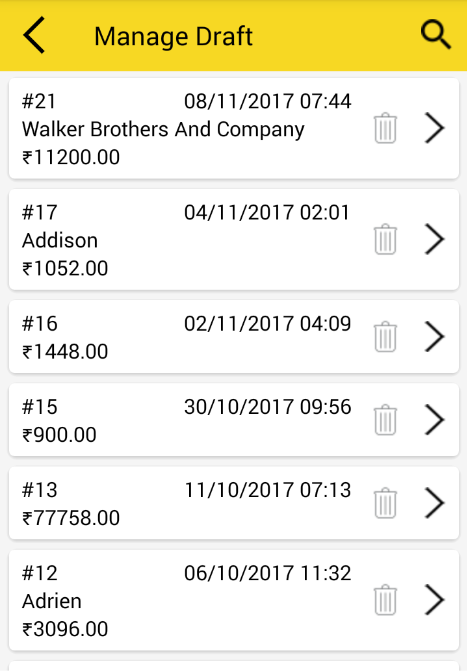 sales order booking application is faster and more accurate than traditional paper-based methods, and can handle large data. 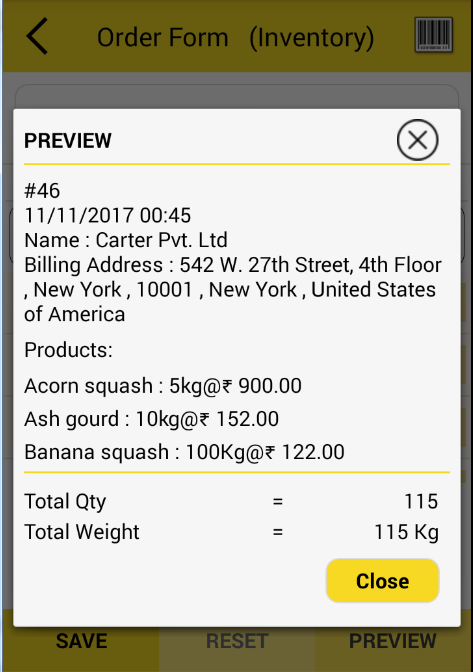 Sales Assist App can be used as like a Sales Order Note or Sales Order Booking Apps. 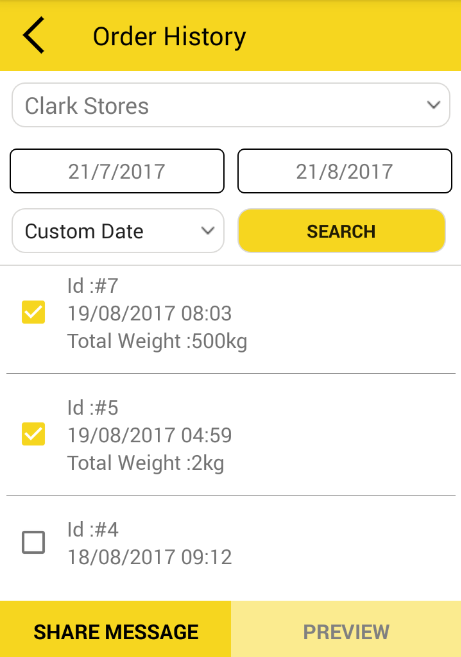 Easy to Manage Stock and Track Inventory. Manage Application dashboard and drawer Modules and can hide/disable some not required features from application. 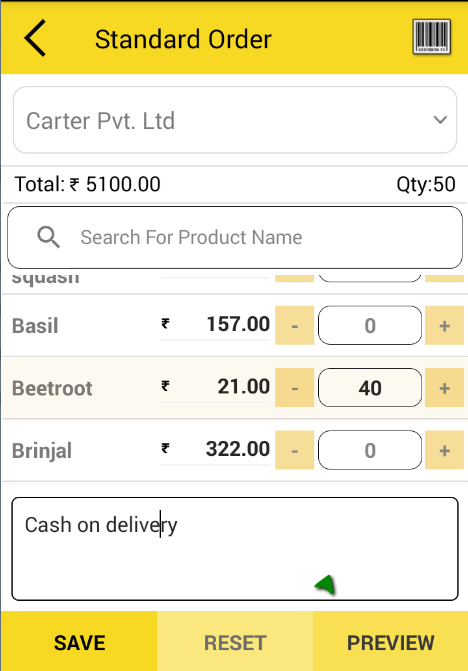 Easy to select customer and view details while creating an order. Easy to add signature and company logo in Order PDF and Excel sheet to share with customer. 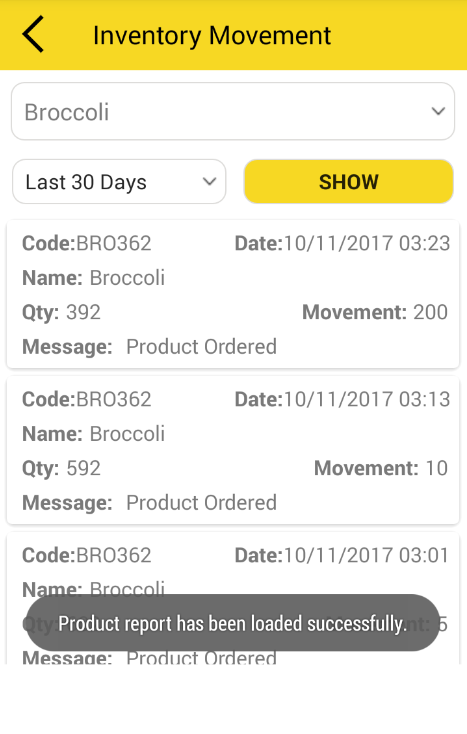 Create Delivery memo of your sales order to keep track of inventory. 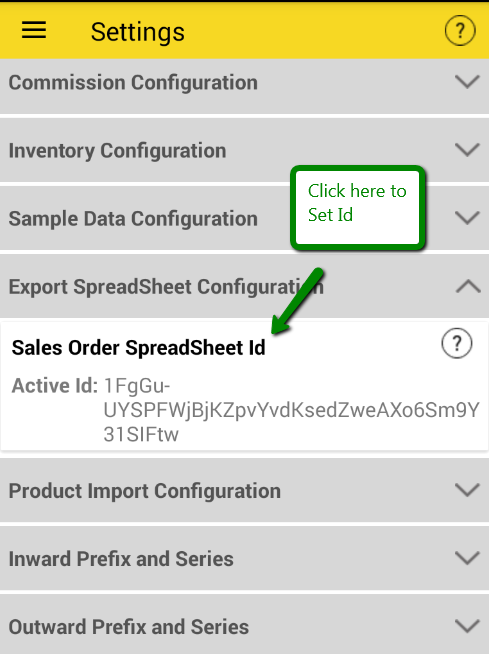 Create Goods inward list for your purchase order to keep track of inventory. Easy to Get Total sales and purchase report for Day, Week, Month and year. 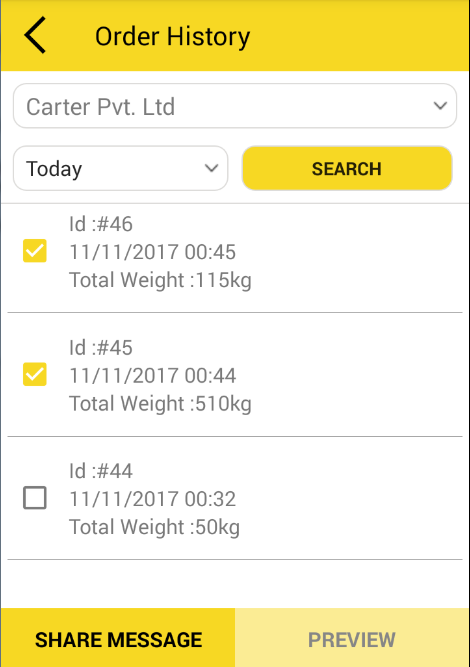 After updating product or customer CSV and importing it, If Product Code found same in app, then product data will Update/Replace in app. 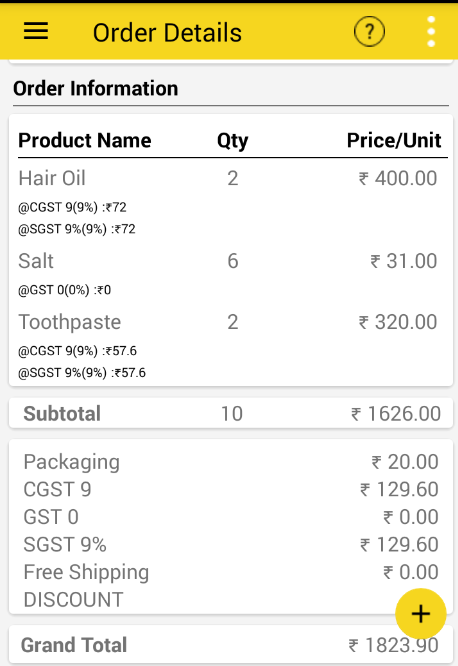 If product code does not exist or not found in app, then it will create new product after importing CSV. – You can share PDf of order with your vendor instead of message to use product code. – First, configure PDF from setting section and enable “show product code”. 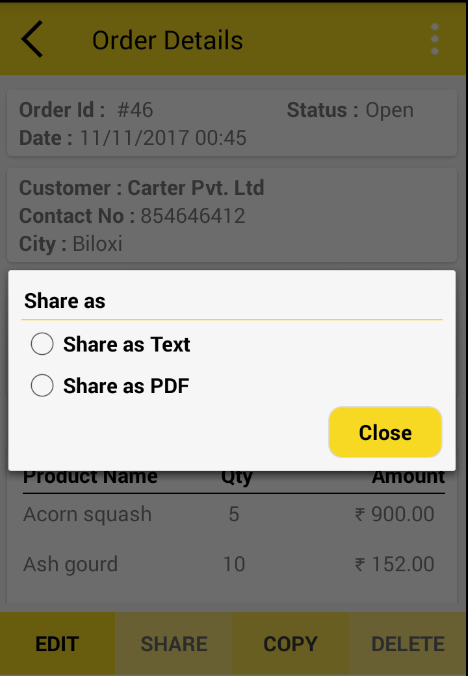 – Then share your order as “PDF”, So now you can share product code with order also. – Yes, You can use application as product catlog to show your product detail to your customers. – Multiple product image to share with customer. 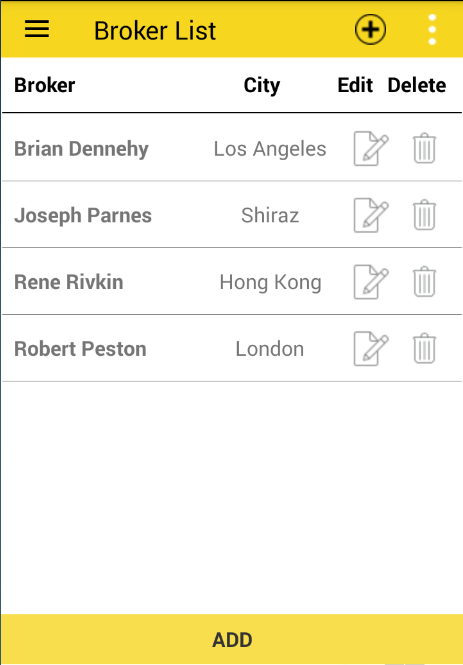 Currently ” Create Delivery Memo” or “Create Goods inward” Feature is their, but no share option in application. 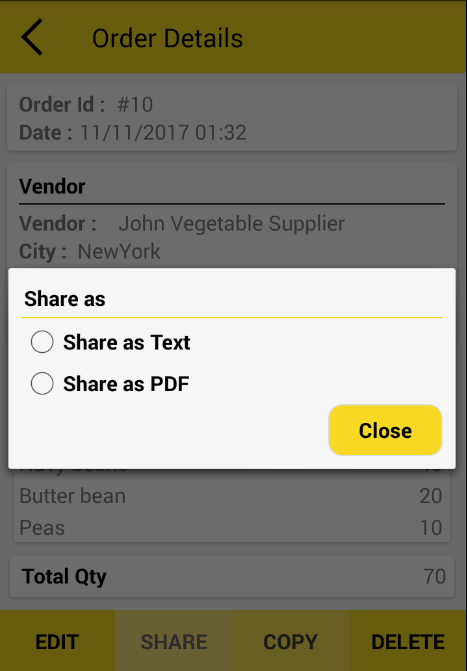 For now you can share “Dispatch order”(which is delivered) with your customer in text, PDF, Excel. 1. 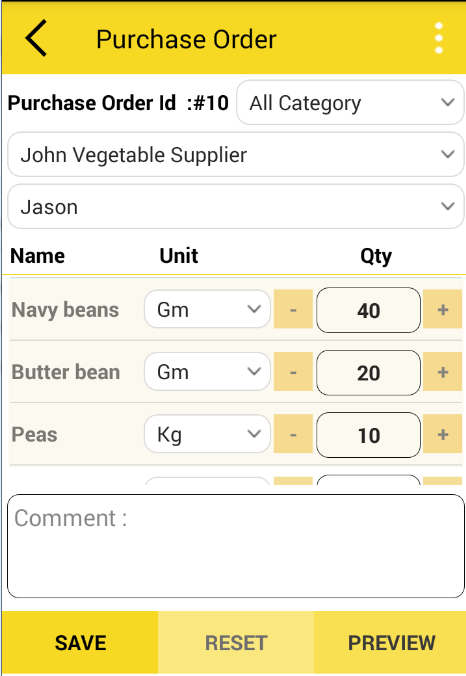 Create delivery note from sales order detail directly. – From order detail >> click on ” create delivery memo” from right upper corner of toolbar >> Now, save Delivery memo. 2. 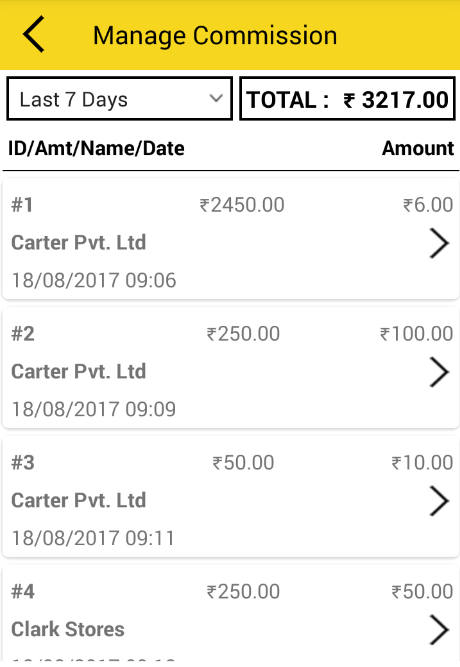 Create Delivery memo of order manually from order form without using order. 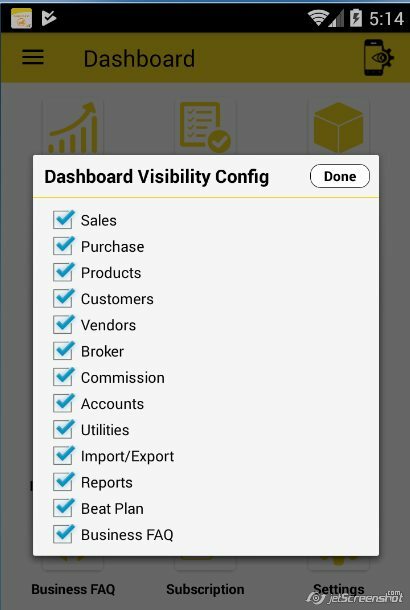 – Select Inventory icon from dashboard >> Now, select delivery memo/goods inward form to create record of delivered goods and received goods. How do I make an order as completed? – Currently this feature with completed status is not available in application, We have plan to release it in upcoming releases. For now you can change order status as “Dispatch” from “Open” Status. It will help you to distinguish order. You can change status from Order detail >>select ” Dispatch” status from right upper corner. Now your order staus will change. So from order listing you can filter orders as “open” and “Dispatch”. 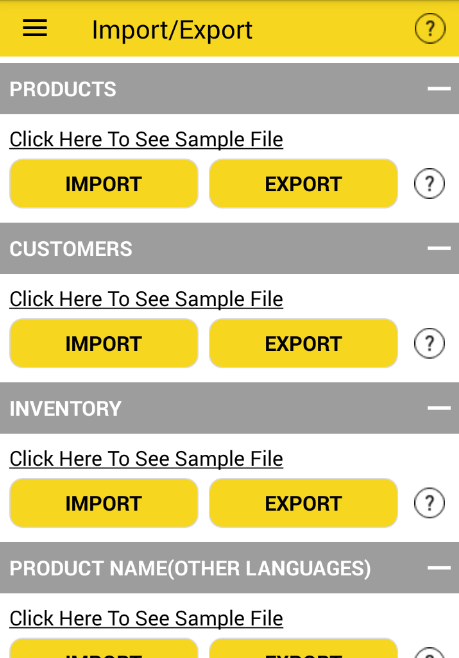 Yeah, you can export orders from import/export screen and share with your boss. That file will be in “.csv” but you can view it in excel also. – There is No limitation, but as we have tested with 1000 orders.so if you have any problem then please let us know. Sort order is help full to manage sequence of product, as per your requirement. 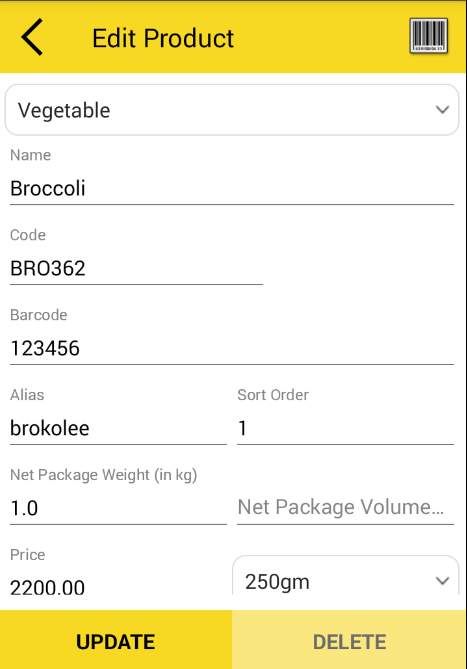 By default product list show in “alphabettical `1order”, but if you have some products which important and want to show first, then sort order is usefull for you. – Now, Connect device with bluetooth printer. – Application search for bluetooth printer device and connect. – Now, when you click on print option the order detail will print. – This feature is integrated with 2inch and 3inch printer, so easy to carry for executives. 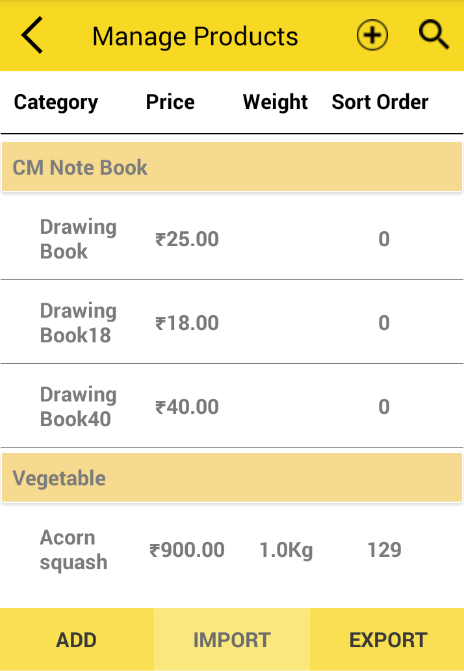 -Order as well as report can be print using this feature. – From Dashboard select Utilities >> Manage Tax. 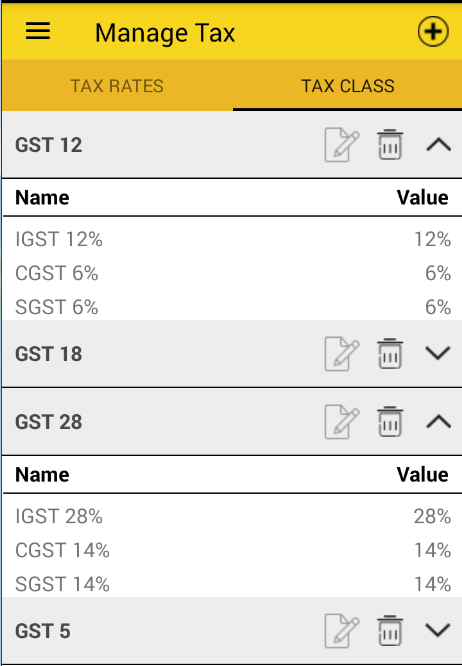 – Click on “+” icon on right upper corner to add new tax class and rate. – Select tax class from dropdown or add new tax class. – Now, add tax rate discription and its percentage value and click on submit. – Now your tax is added and it will reflect on tax order form when you place order. 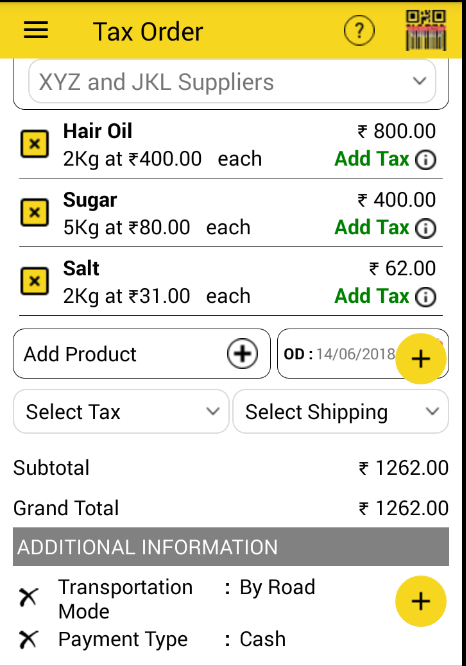 – You can add product based and order based tax. Yes, You can add multiple image for single product and can use product detail as digital catlog. – On add product screen, In additional Attribute section, clcik on browse option. – Now, when you click on add button, your product with image willl save. 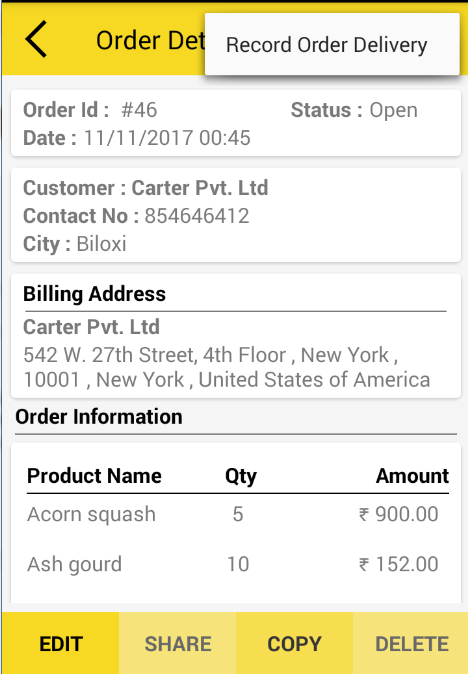 While creating order on Tax order form, there is option to add/upload/attachment image with order to share with third party. 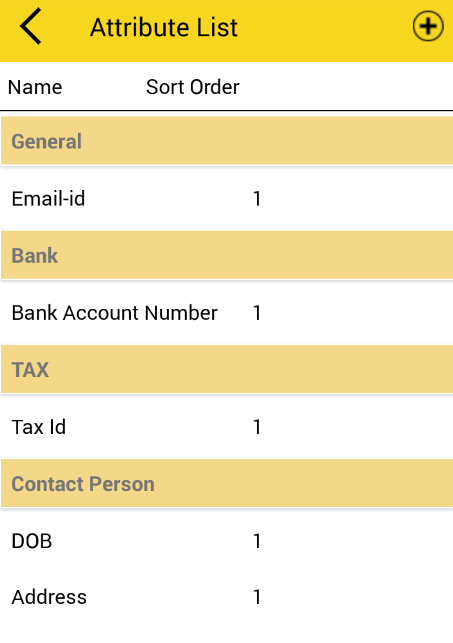 – On tax order form, click on middle “+” icon. – Attach any image as per requirement and save it. 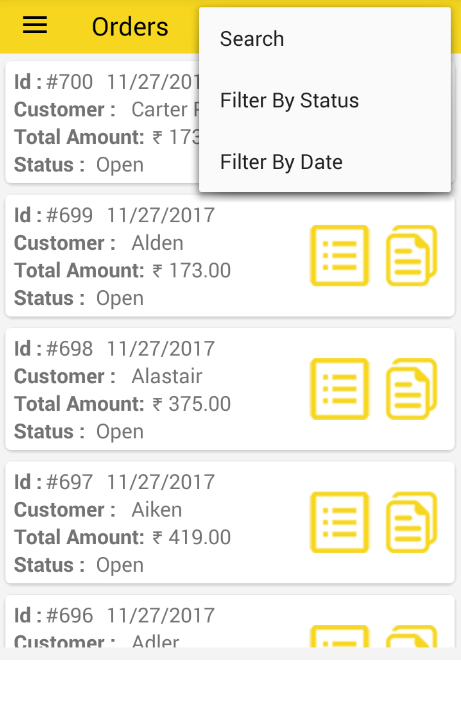 How do I create Transaction in Sales Assist? 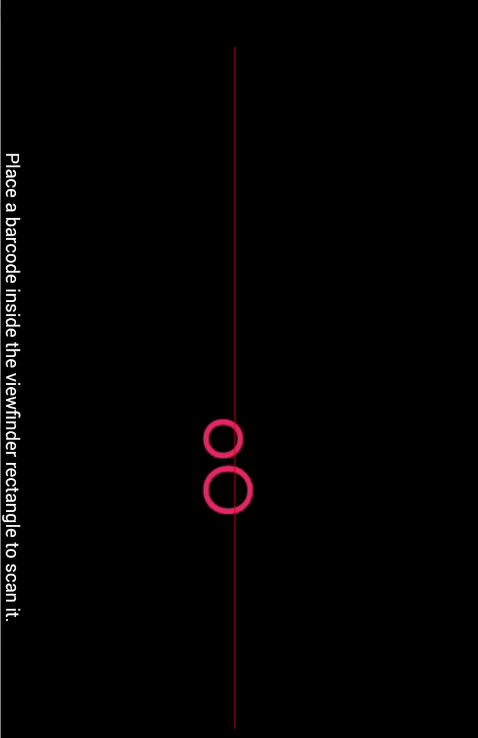 – After installing application when you open app, you will see dashboared screen. 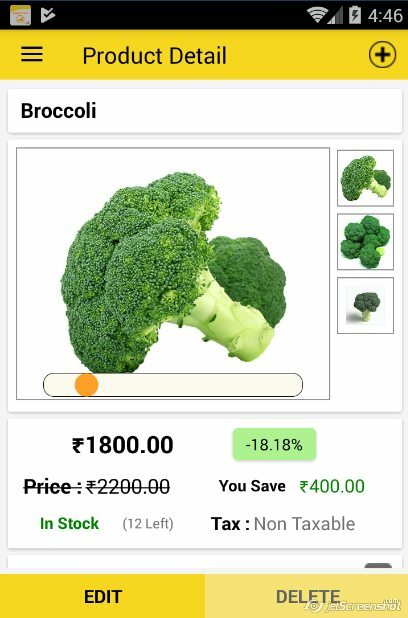 – On dashboard, You will see Sales and Purchase icon. – To create sales and purchase order, first add product and party name. – There are three separate sales order forms under Sales >> Order form. – User can use any order form as per their business need. 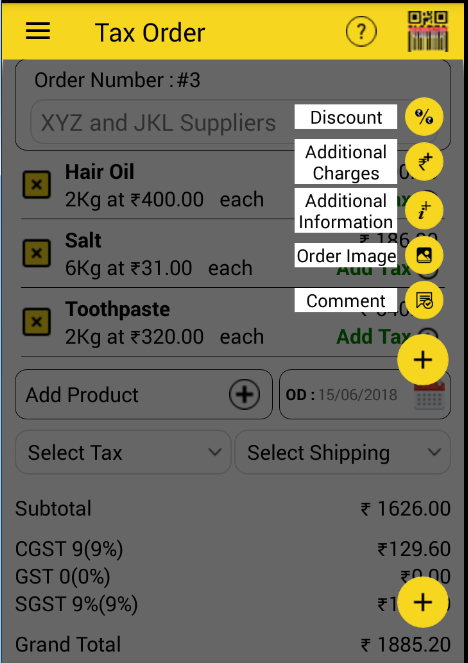 – Select customer and add product on order form, Also user can add Tax, Discount, shipping, addotional charges and additional information, any image attachment and delivery date as per need in order and save it to create order. – Record order as delivered. 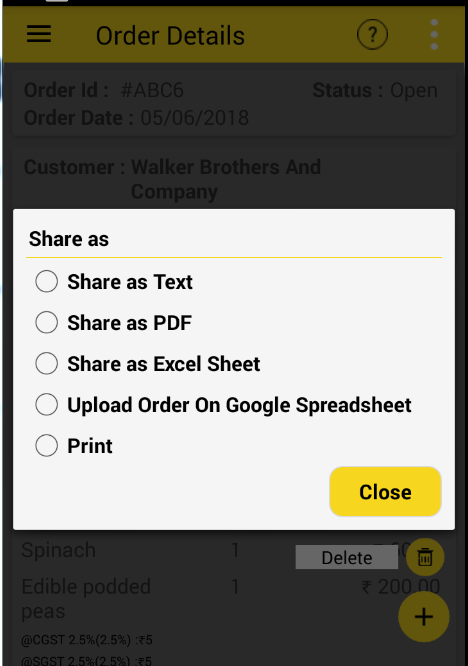 – After order created, you can share it with customer/party in Text, PDF, Excel or can print order and provide receipt. 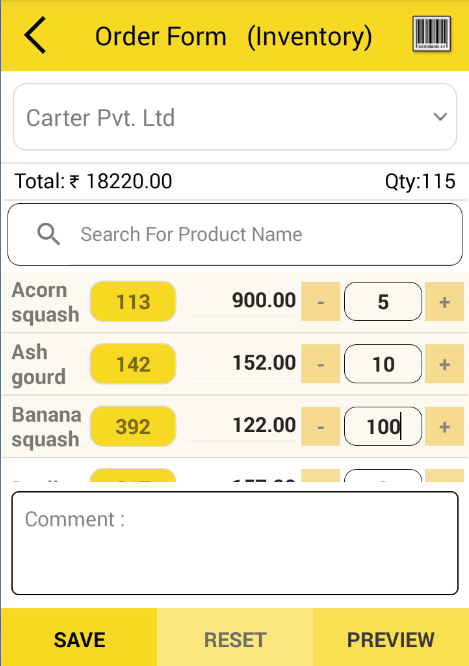 – If user want to create order but temprary its on hold,or in case of Estimation/quotation then user can use order draft feature by clicking on “+” icon on order form. – This created order pending payment can be added in payment followup under account section. – There are two purchase order form under purchase >> PO form. 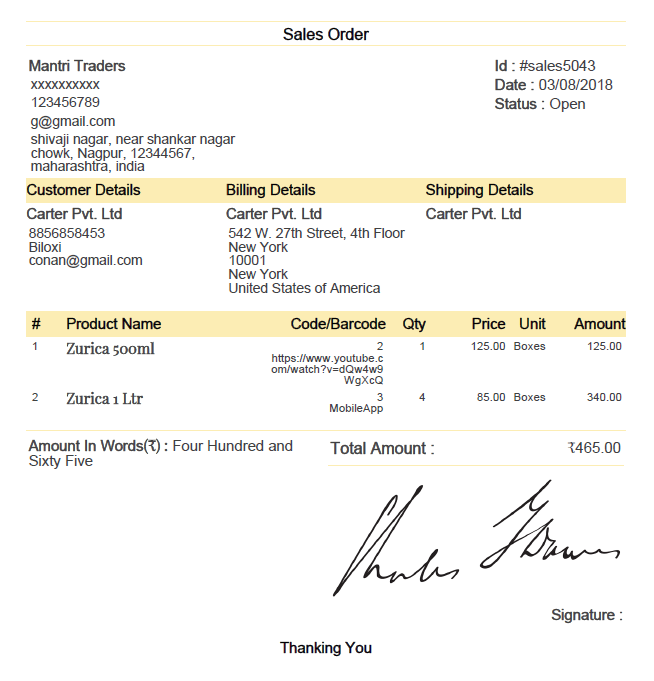 – Also you can create PO from Sales order directly. – User can create order and share message with supplier to purchase item. 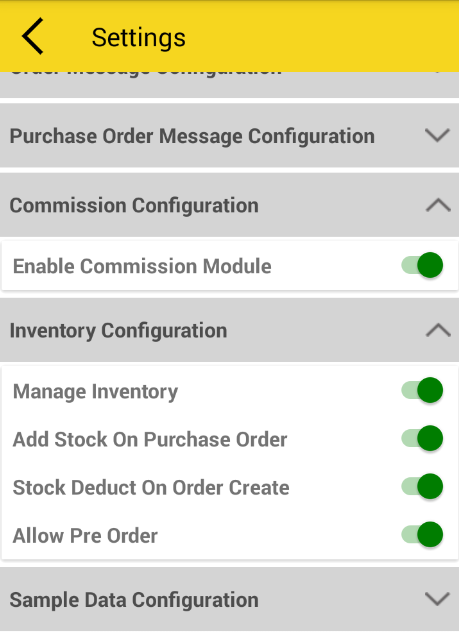 Note: You can custemize order configuration from settings like show firm detail in order message, configuration, Currency, order message, PDF configuration, Inventory configuration. 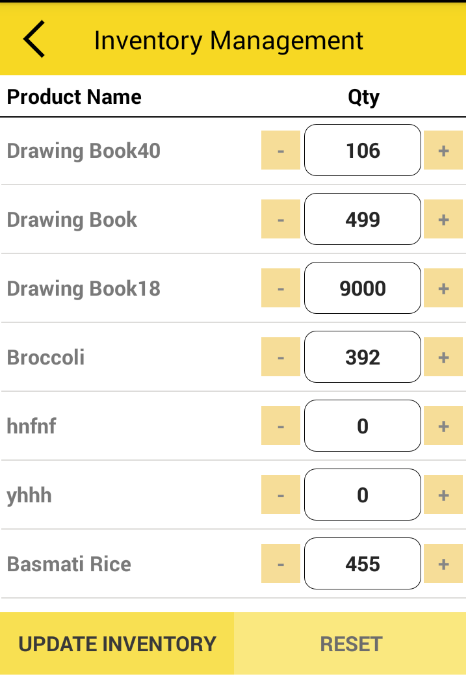 Which features help me in Sales Activity ? You have to install application from playstore and you can start using it. No need to register and no trial period. 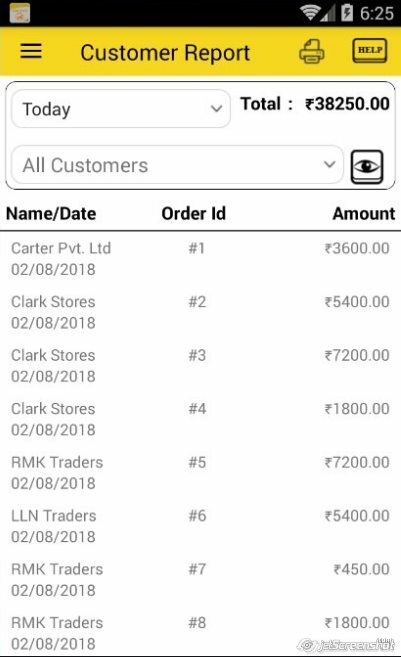 Free application with complete sales activities as below. 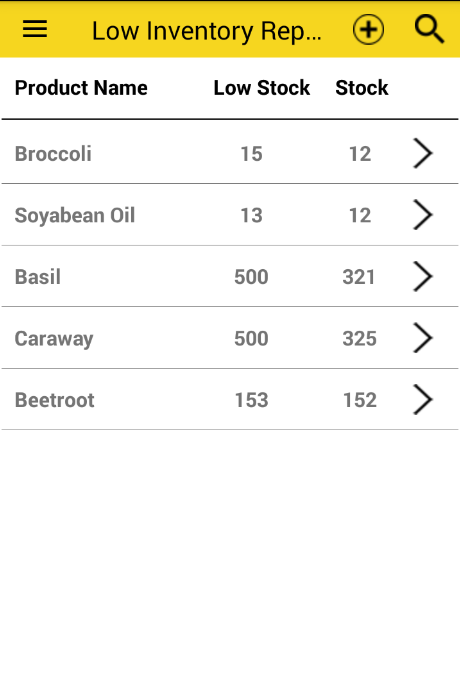 – Add your products or or Bulk data by using CSV file. 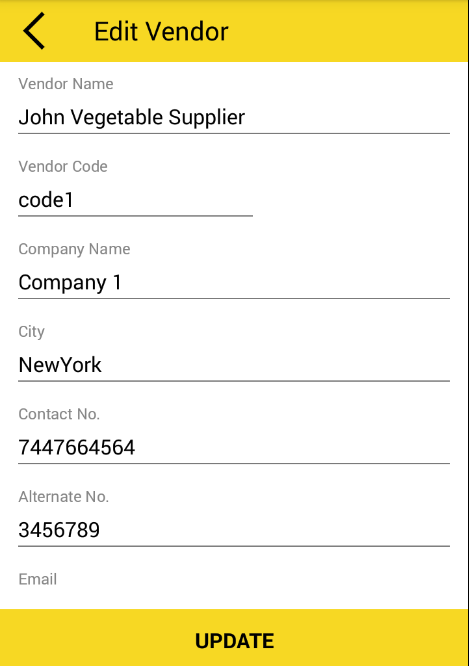 – Add your Customers and Vendors/Suppliers manually or Bulk data by using CSV file. 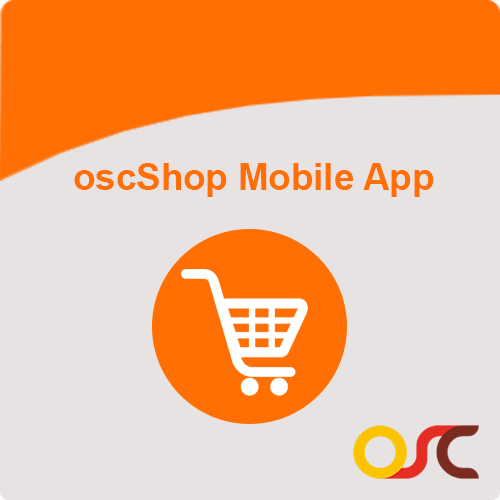 – Now you can create Sales and Purchase Order by clicking on that icon. 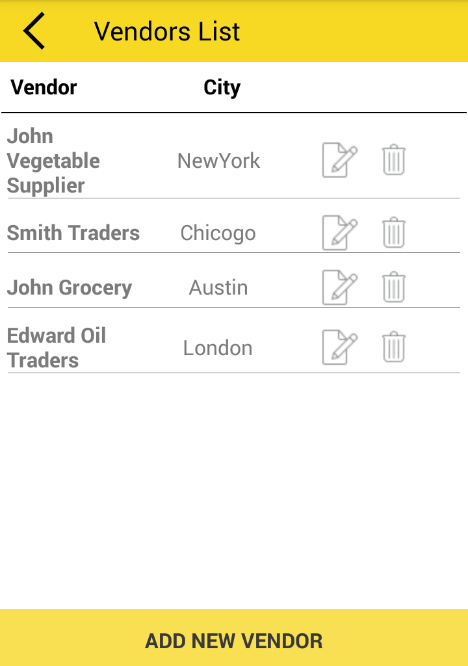 – Import and export orders and share multiple order with your boss. – Helps with some other sales activities like Reports, Sales Visite plan, Commisssion and Broker. 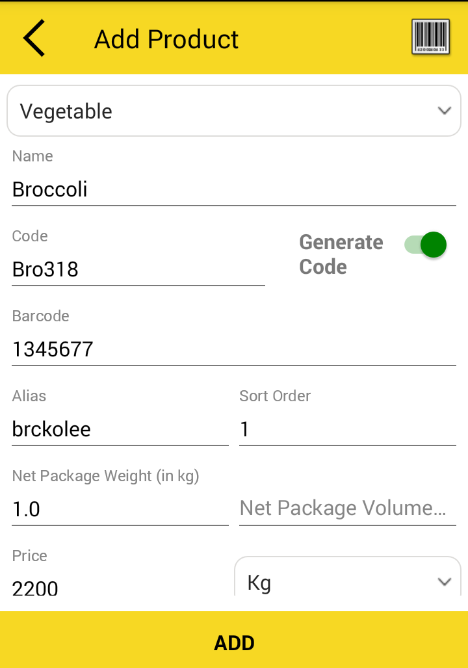 – Barcode help for fast order creation. 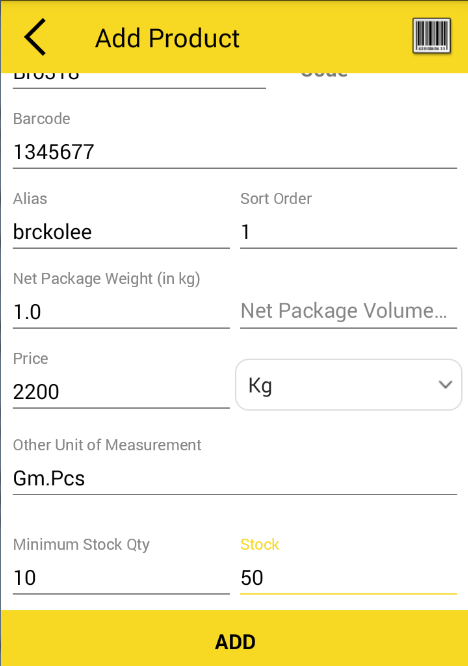 – For that first you have to associate/add barcode number with every product by scanning barcode number from scanner(mobile camera) by clicking on “Barcode Icon” on upper right corner. 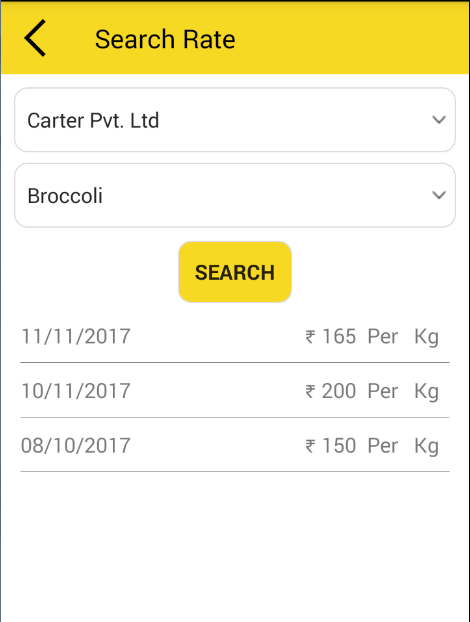 – Now, on order form, on upper right corner there is option to scan product, After scanning product will be automatically added in order. -Uom means unit of measurment. Your products, that you sell in KG, GM, LTR….or any other unit then that is default unit. EX: Many time it happen that one product that, we give in KG, GM, BOXES. – From Dashboard select Utilities >> Manage UOM. – From upper right corner, clickon “+” icon, to add any new UOM which you required. 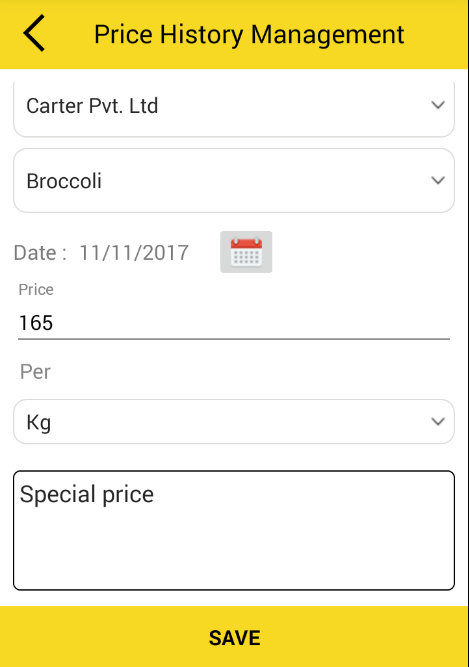 – This added unit will reflect in add product and order form. 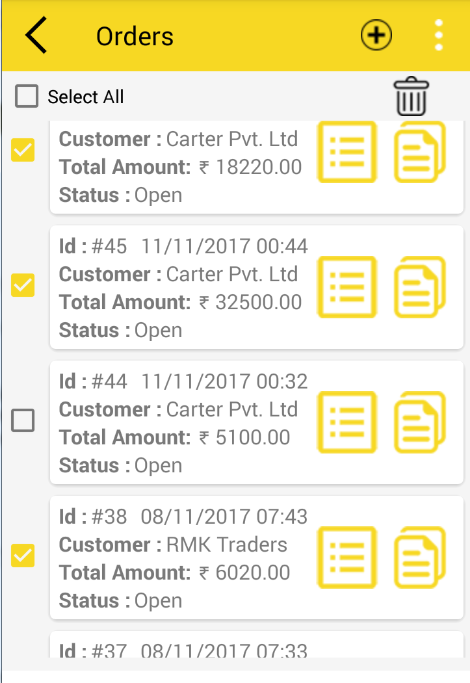 This is the very important and usefull feature for sales executive to report higher authority about their orders and Admin to view all order report on single spreadsheet from multiple executive. – Owner should have to create blank Spreadsheet and share on email Id of their team or sales executives. 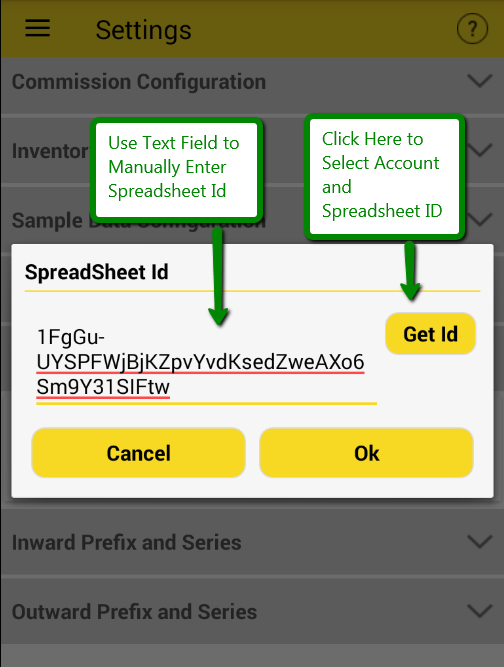 >> Click on Get Id to auto- fill and Select Account where Spreadsheet is saved. 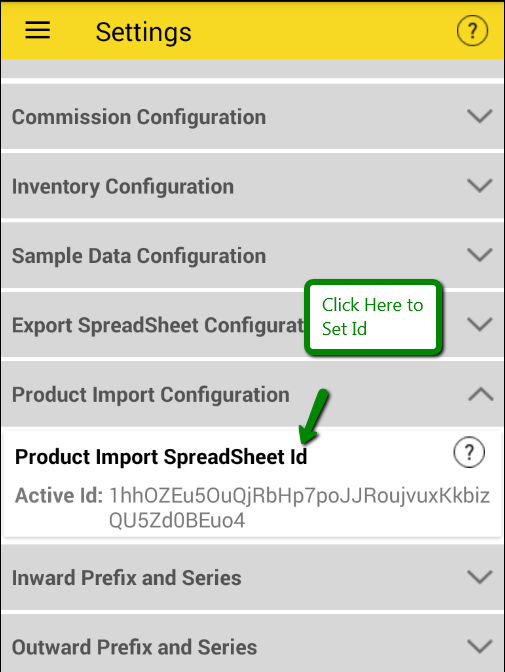 >> Select shared Order Spreadsheet where user has export order on Drive. >> And click on ok.
particular Spreadsheet should be Selected/Login with application. Then only it will work otherwise it will give Error message. 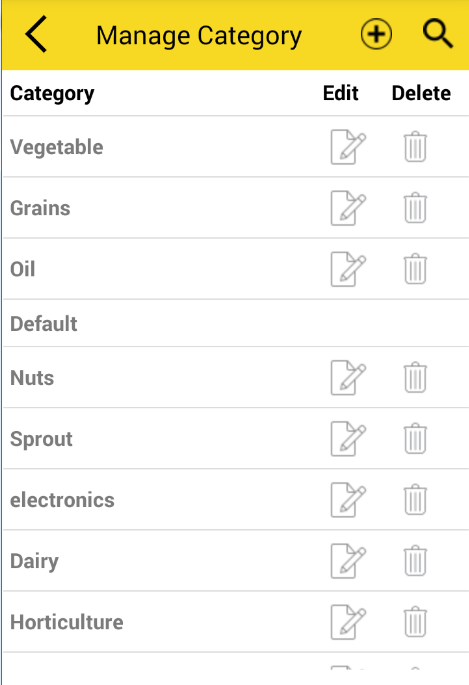 – This helps to add, edit, delete category from list. 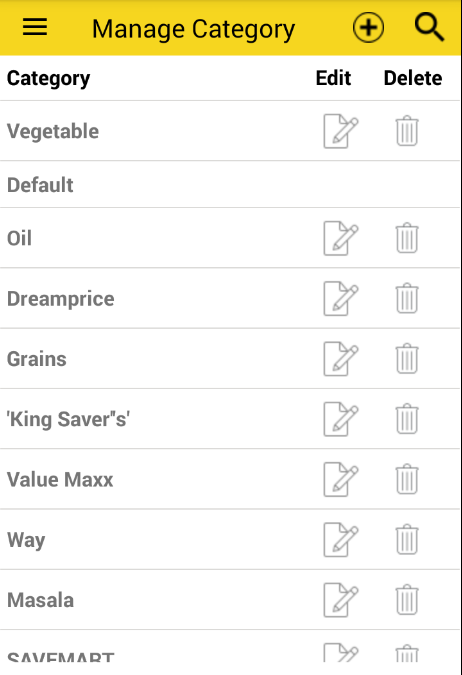 – User can add and search Category of products from toolbar. – When user delete the category it ask for confirmation. 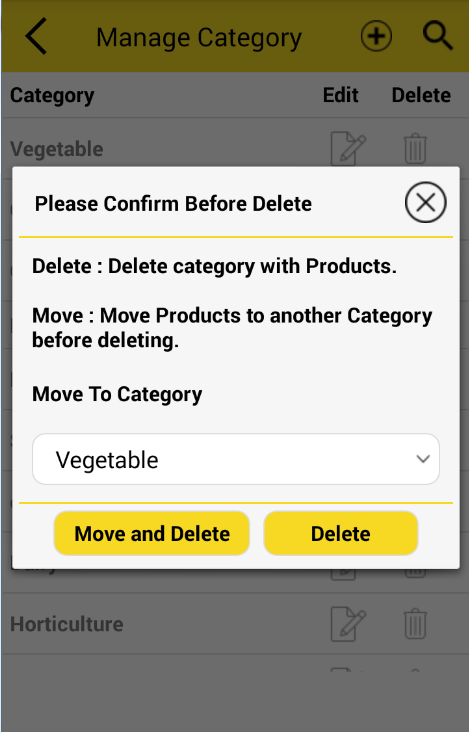 – If user wants to delete category with products then click on delete. 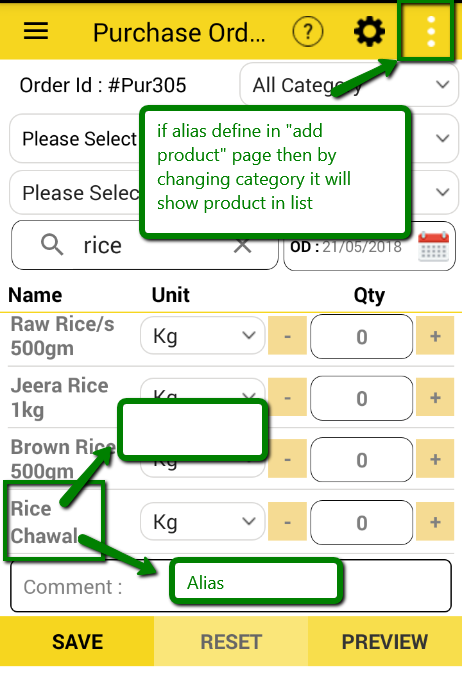 – If user wants to delete only category and not products currently present in that category then user can move that products into another category. 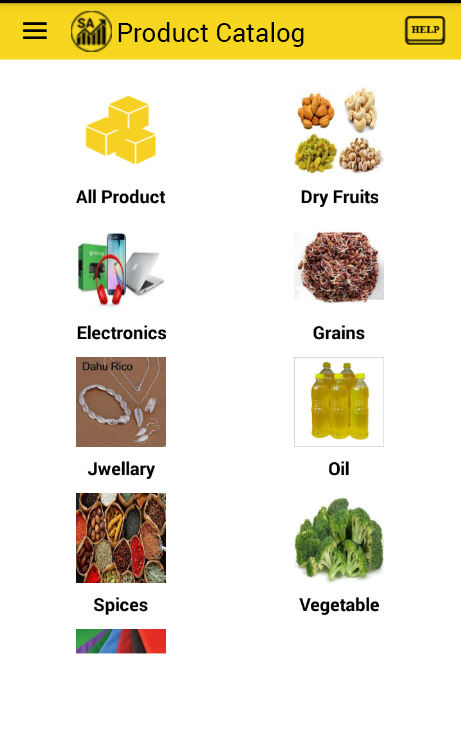 – To move products in another category select category in which you want to move the products. 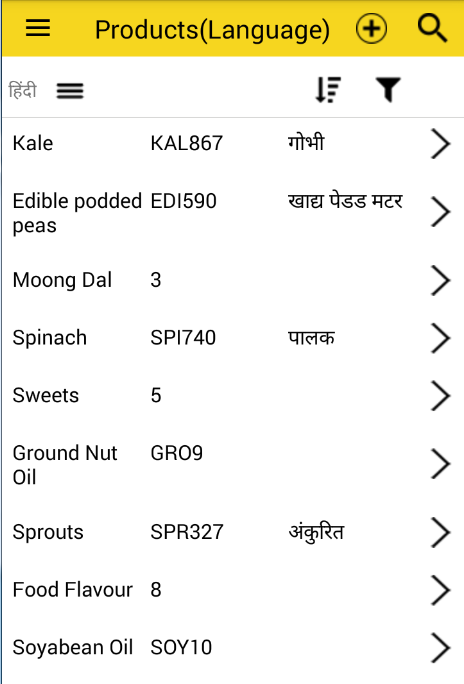 A sales executive can install this on his buyers mobile and train them to create purchase order and send message. Also a sales executive can use for his own procurement related to business activity. 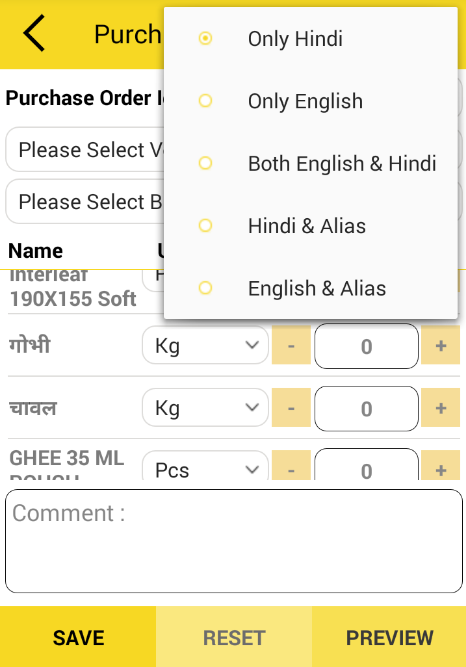 – Select language of Product by clicking on icon of upper right corner of screen. 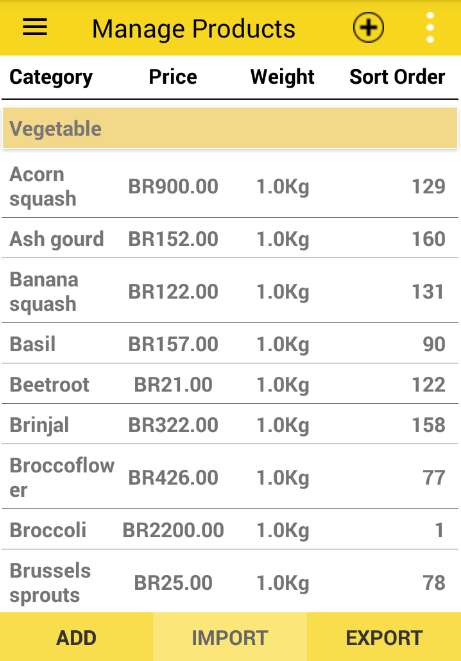 – User can select category of product by clicking on select category option. – User can select vendor name from drop-down or can add new vendor. 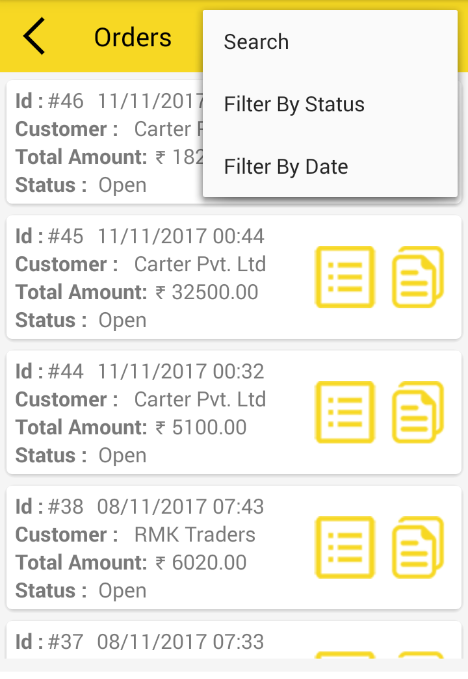 – Fill the detail of new vendor and click on add button, User can select the newly added vendor from “select vendor” drop-down list. – User can change unit of product(kg, Pcs. 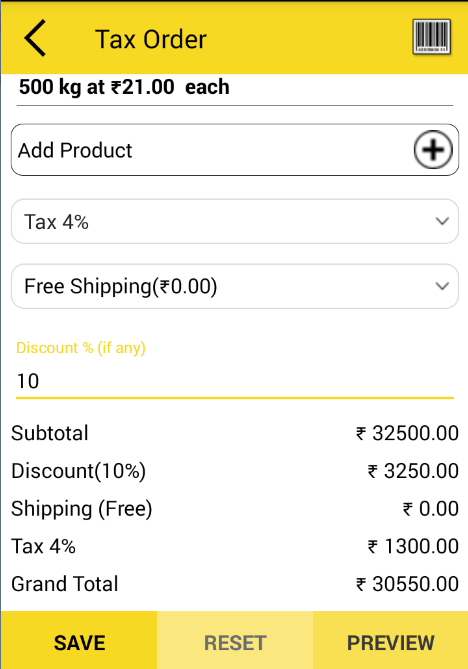 Lit) and quantity of Product by clicking on “ +” sign. – By clicking on Preview user can check the detail of order before sharing through social media. 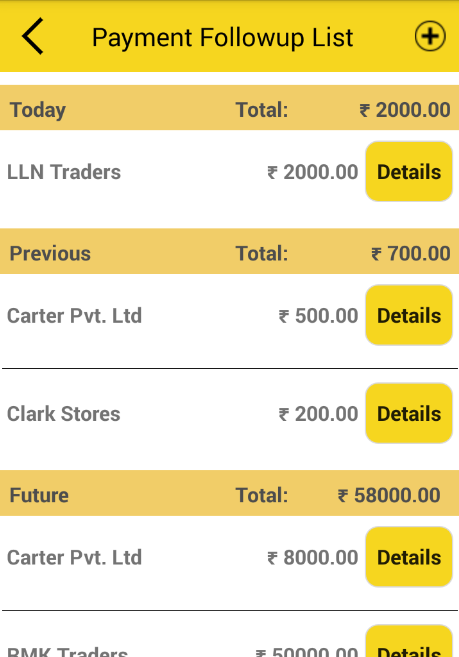 – In Purchase orders list user can see all the list orders which user had placed . – User can search vendor name from toolbar search icon. – After clicking on detail icon, user can view, edit, share, copy and delete the order. 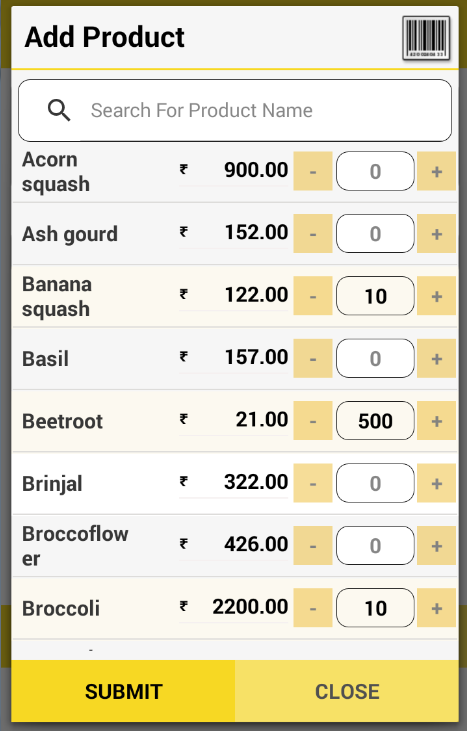 – By clicking on Copy icon- User can Easily refer to previous orders which helps in generating new order. 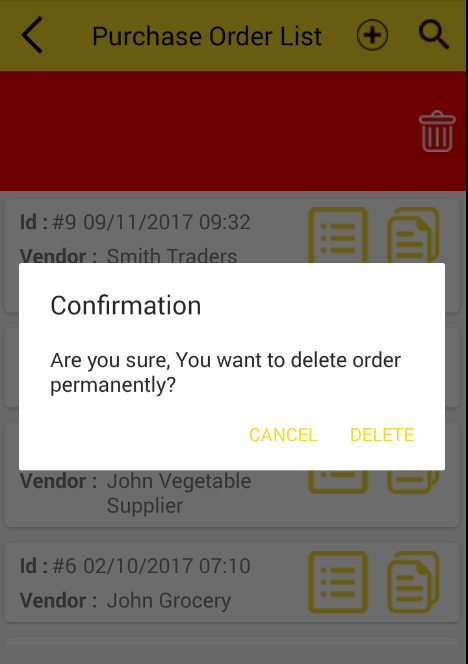 – If user wants to delete multiple orders at a time, then long press on any order then check-box will open, check-mark the orders which you have to delete and click on delete button. 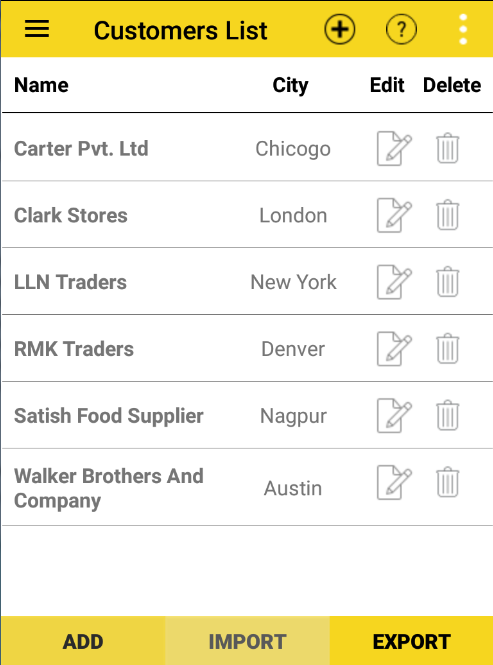 – Orders in list can be edited and deleted by swipe in right and left respectively. 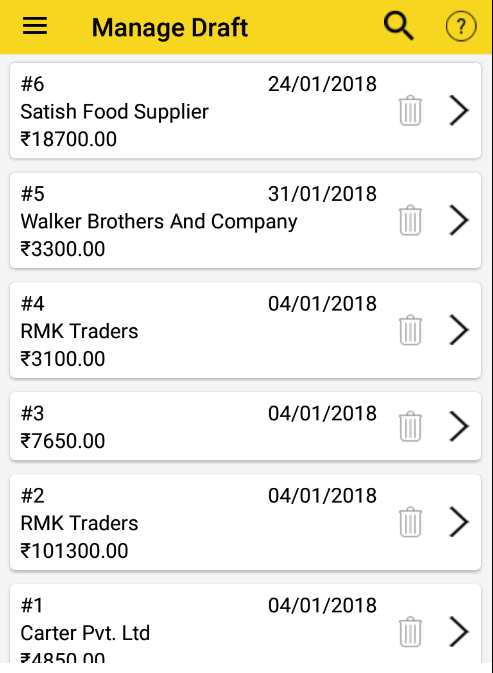 How to create order from Inventory order Form ? 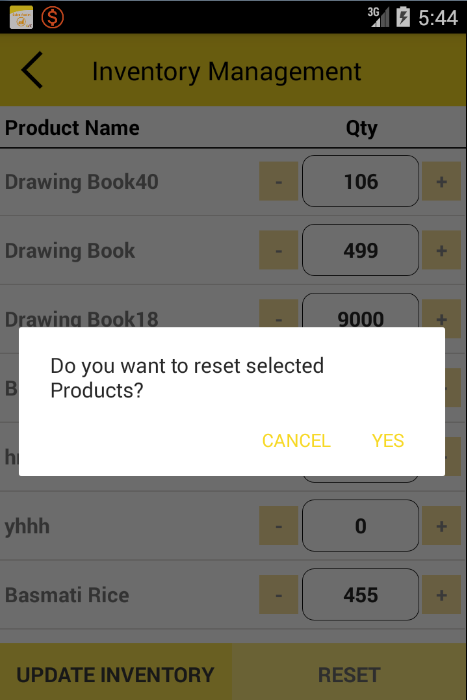 Here user can update inventory and use that as a reference while taking sales order. 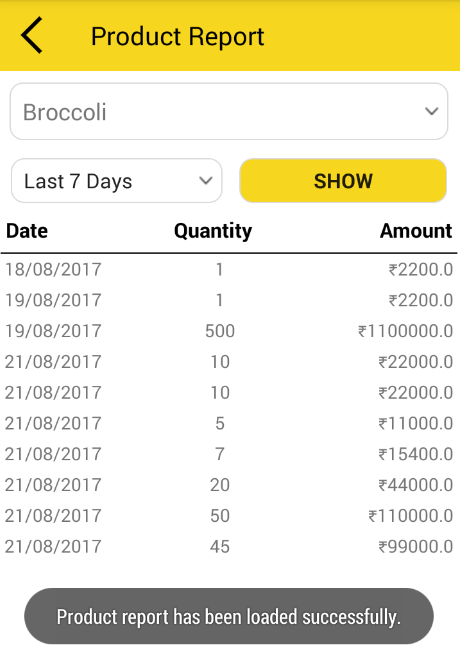 Order form with inventory is where user can order the product as well as maintain stock. – Select Customer Name from drop-down. – User can search particular product directly in the search block. – By clicking on “ +” or “-” user can select quantity of product from product list. 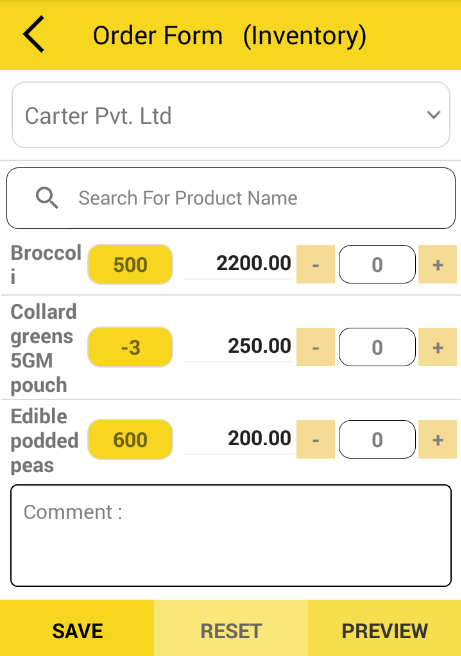 – By Clicking on preview, user can check order details like Total amount, weight, and quantity before sharing with the seller. – By clicking on Save button user can share the order with your seller through social media. How to use Draft List? 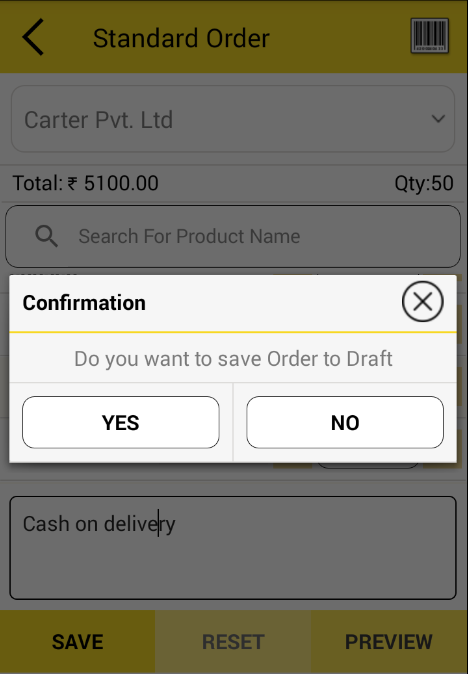 Draft is useful for saving order temporary in draft before placing orders. 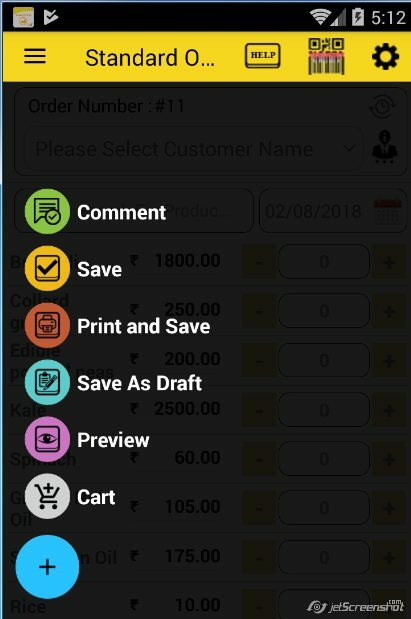 -Which reduce our time to re-create order from standard order or from order form inventory, but suddenly when you click on back button before saving the order then application ask for ” save as draft”. -After clicking on “yes” it will be saved in Draft list which you can place later. (It also save our time to place total order again). How do I share the order to my customer ? that time you can share the order to the customer . What is Product other language ? :- It is defined as other language name for the product . You need to make sure Product Name , Product Code must be define while using this feature . For example. When I import products it shows the error message ? in import/export under products . How to Import Exported Order? 1. User have to check first Order CSV file provided by sales executive, if file is in proper format then user can import it. 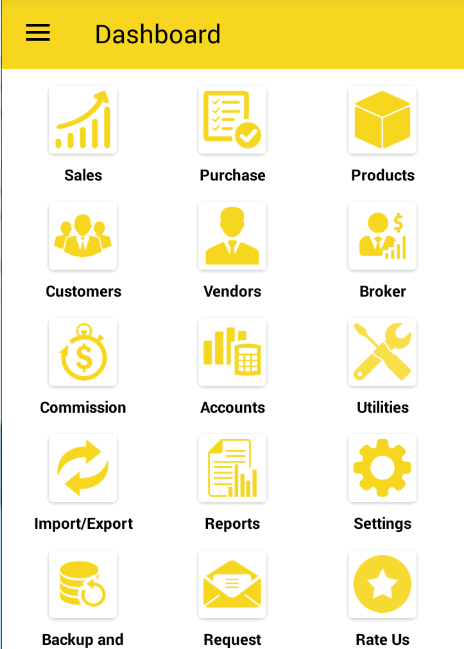 2.After Importing Orders, User (Owner/Higher Authority) can view orders with details provided by sales executive. 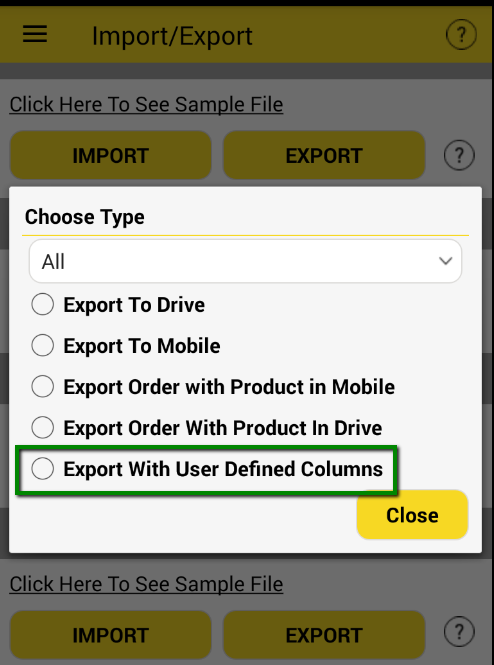 Note: User can import that file only, which is exported in export type “Export order with user define column” sheet format. Improvement in Save and Share option while taking order. Import from google sheet from drive (inventory and customer). Add small osc logo in header on all pages where it is possible. Improved PDF With Configuration On Logo, Description, Bar-code, Product Code and Signature for SO and PO. Enhancement of setting functionality(on every screen). 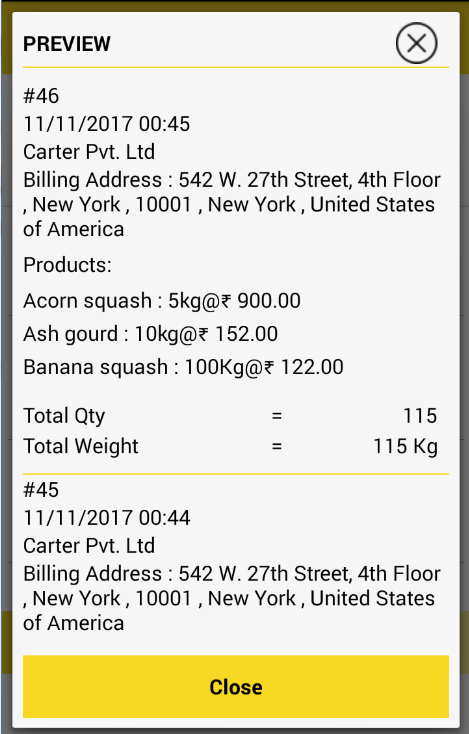 Fetch Data from phone book for alt. contact,email,city,address if available in contact. 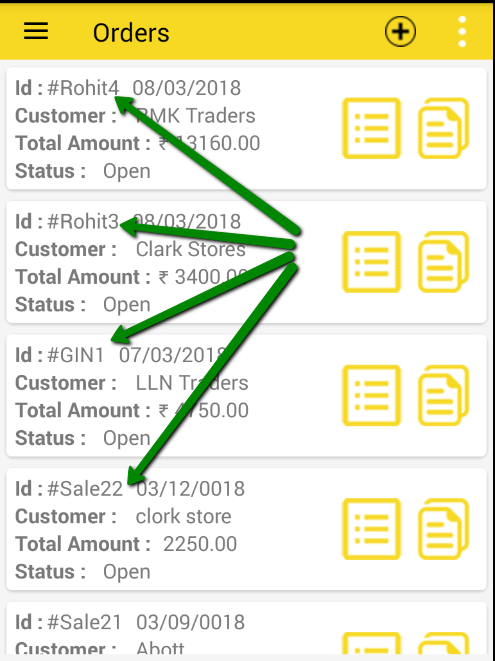 User Defined ID for Sales Order Series & No. Support Multiple language in PDF. Backup and Restore in mobile. Show Notification Backup and Restore Data. Business FAQ for Sales Executive. Easily View Exported file(CSV and PDF). 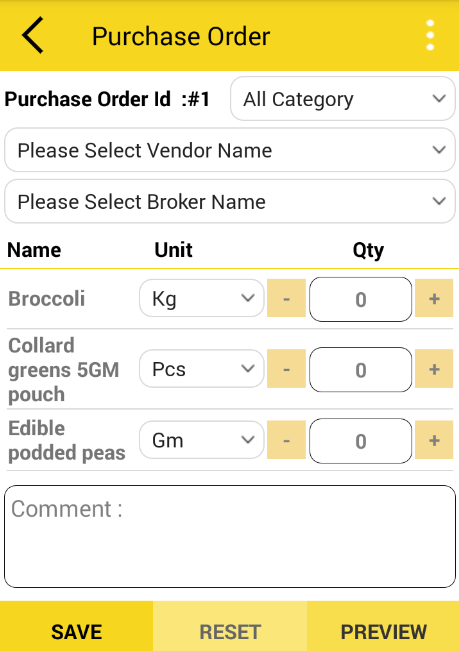 Sales Order Id Configurable for Preview and Share Order. Search and Filter in Broker and Vendor Page. Unit price of product in PDF. Bug Fixes of Order Date. Low Inventory Report With Notification. Give Support for Dutch language. 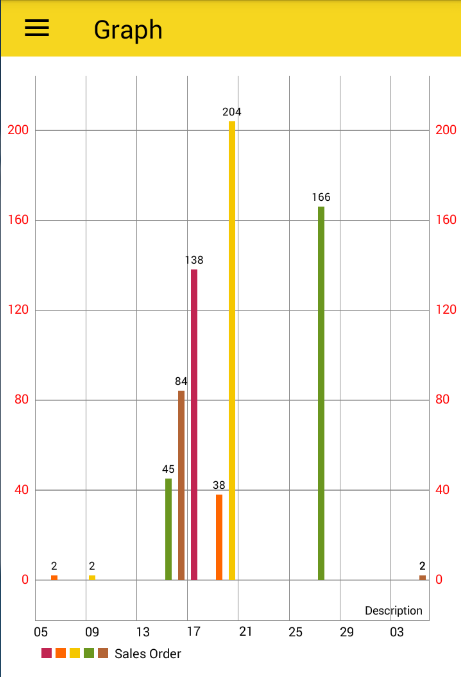 Graphical Report of Last 30 days Sales and Purchase Order. 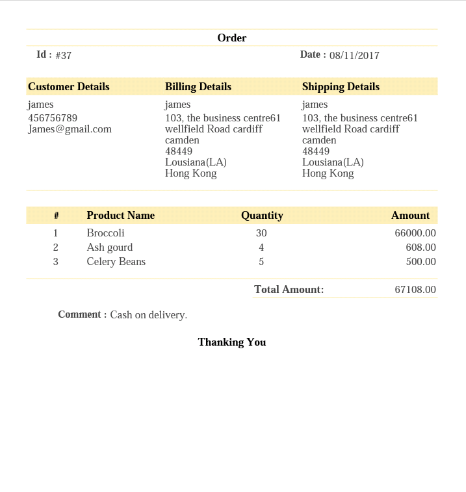 Purchase Order Export in PDF. Get All Product and Customer Report. Multiple Delete of Product,Customer,Sales Order, Purchase Order, Vendor,Broker,Product Commission,Payment Follow Up. Changes in Customer Mandatory Fields. 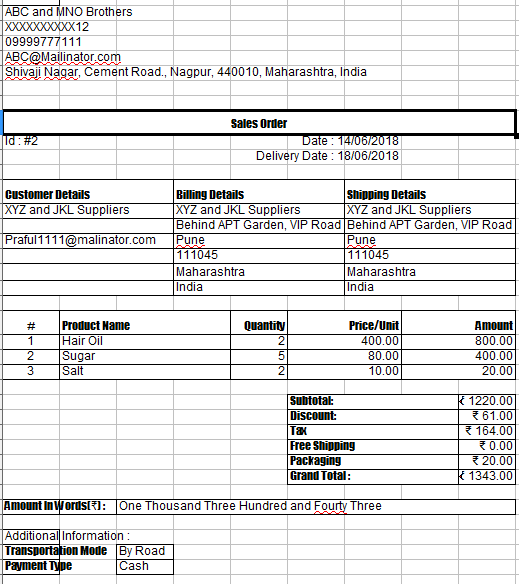 Simple & User Friendly view of Sales & Purchase Order Detail. Order can be placed without Rate. 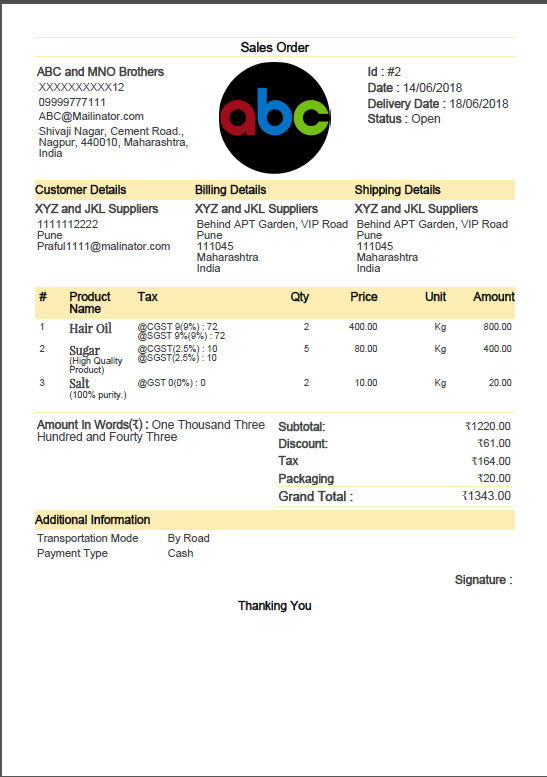 Customer Billing and Shipping Address in Add Customer Page. Customer Additional Attribute For Additional Information. Customer Details Page. -Stock Movement. Change Setting Page UI and Interface. Export Order PDF. -Broker on Purchase Order. Search on Manage Product and Order page . 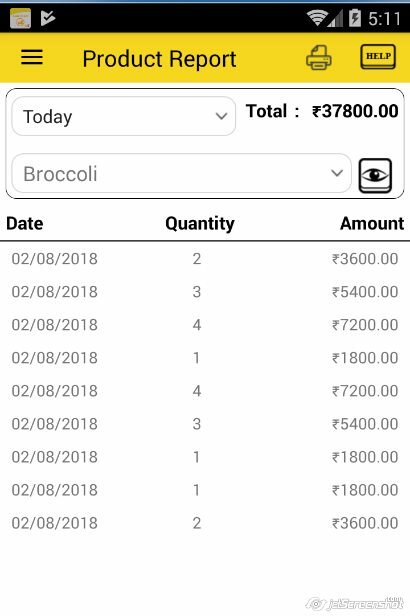 Order History Filter (Datewise/Customer Wise). Delete System Defined Data (Sample Data). Thank you very much for adding the dutch language to this. For some in my country it would help a lot. Keep up the good work. Great app. 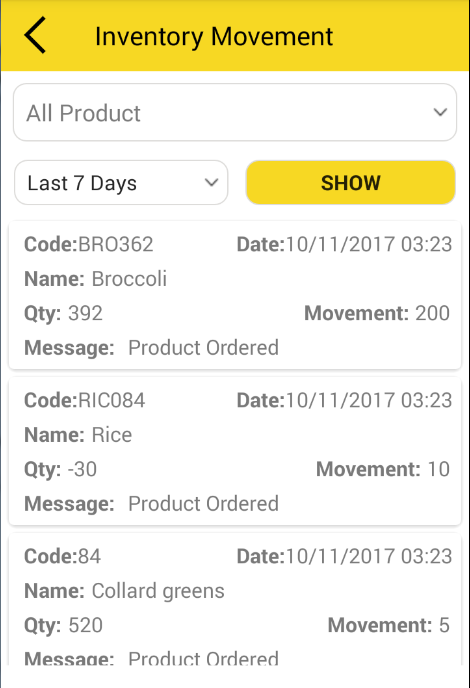 Helped me organise my team to process orders on time remotely. I love it before I even start using it. I’m very thankful for your reply. Secondly, I again appreciate your app & I have decided to use it for my business. As you discussed about many new features, that’s are good. But I would like to discuss some of my experience with this app so that you can add some new features at the priority; based on practical needs. 1- There must be provision for multiple users with different user roles. That’s very much needed as you may know that all web based business softwares include this. (please include it urgently). 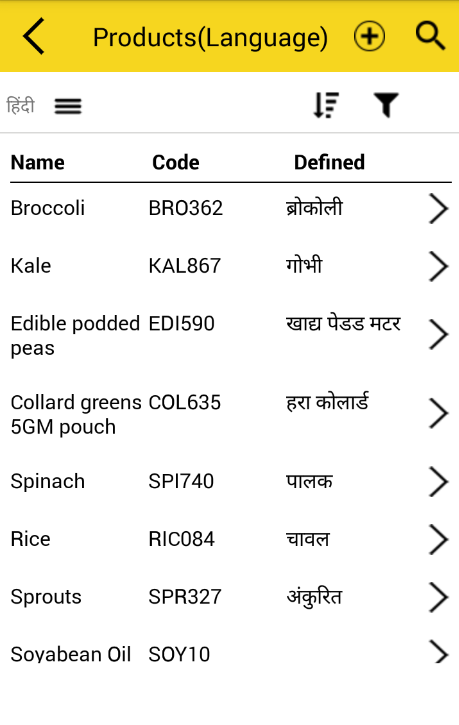 2- In the order form, there must be items code shown. Because when our representatives go to collect order, they take it & tally by speaking item code, not item name. Because it’s not feasible to speak whole item/products names. Also it is not easy for our customers to give us order by pronouncing product names. 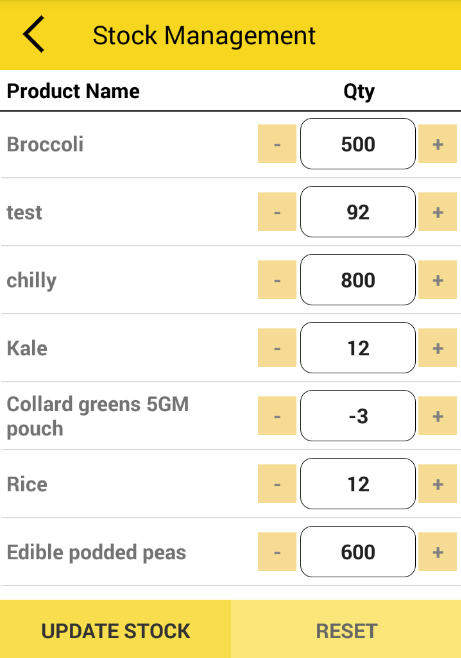 So please add item codes to be shown in order form while taking/writing order. 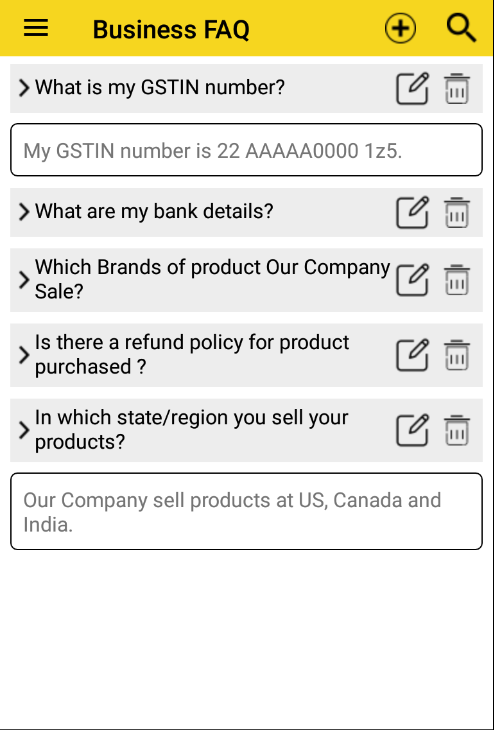 I will try my best to help you improving this app & making it world’s #1 business management app,as it’s most practical app I found at store during my last 1.5 years search.And I will share this app to my known business personals to improve their business management.